The RV Box camera Has a 120° Degree viewable angle, its waterproof and has auto night vision. Has optimal reception for up to 70ft this allows it to work perfectly without interruption in any vehicle. The camera is one of the most durable we have, with incredible adjustability and night vision clarity. The RV Box camera has a metal sun shield visor to protect you from glare and pebbles. This is by far our toughest built camera. It has been regularly used in cars, vans, buses and even industrial sized caterpillar trucks, operated in the harsh oil sand of Canada. This camera can take a direct hit from a rock and it will still work like new. It has also been very popular with RVs because its housing allows you to install the cameras on multiple sides of your RV. This reverse camera is also a wireless so there is no need to run cables through your Car or RV. TadiBrothers only sells one type of wireless camera because its the ONLY one on the market that is reliable. 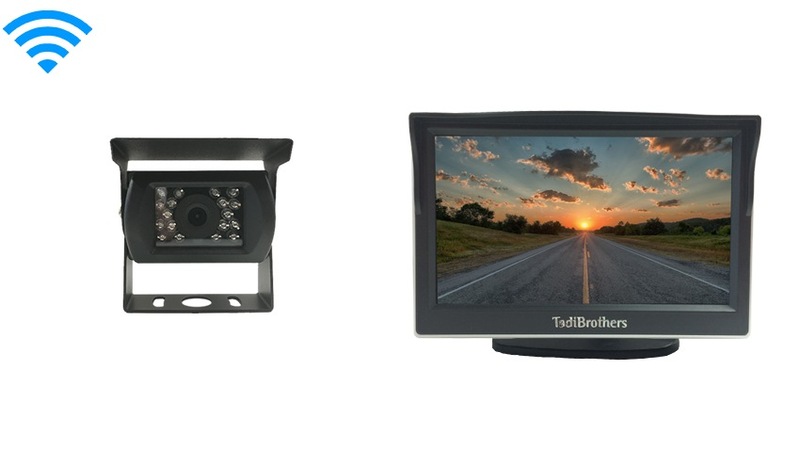 This wireless aftermarket backup camera has a 70ft range that can go through any vehicle. Also, This system, like most of our vehicular products that have an LCD screen, can be used for video gaming, Considering that a perk or bonus for purchasing our back up system (others block that feature). can this camera be hooked up to stay on while the car is traveling to watch road behind RV?